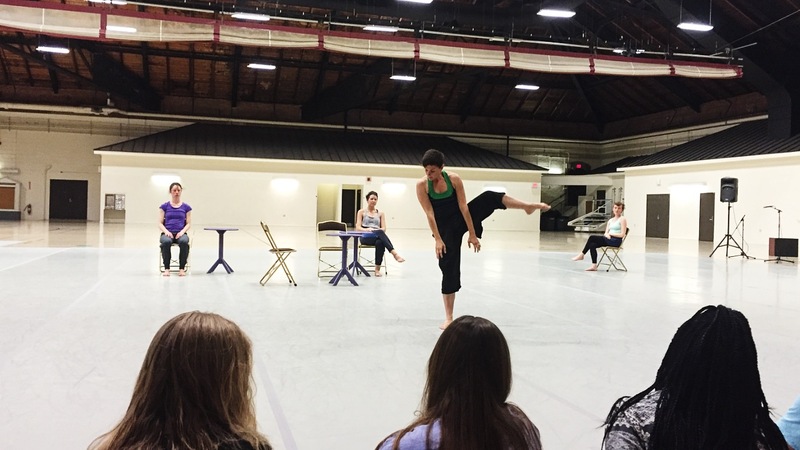 Ali performs for the Young Dancers during an open rehearsal. I made a bunch of phrase material, taught it to the dancers and then manipulated it. I am interested in gesture and how to use it so it feels like it is integrated into the movement rather than placed on top. I am very specific in how the movement is performed and how it is shaped. My goal for the week with my dancers was to dig and craft. It was important to me that I walk out of the week with the piece structured and the work developed. As the piece developed the story started to emerge. I found it difficult to be in it and direct it so I ended up taking myself out of much of the group work. What unfolded was that I became “other” to the quartet. I am now working on how I relate to the others, what our relationships are, what I am to them and vice versa. This is inherent in the piece already but I am going to work on further defining it and figuring out some transitions. Meghan comes back on Thursday. We will be working on further refining the duet for DanceNOW.